2019 Summer Specials! Luxury Disney Condo! 3BR/2BA! Ground Floor! Our luxury 3 bedroom, 2 bath condo is a first floor unit, located near the pool in the Windsor Palms Resort. A gated community, just off of 192, within 3 miles of the main gates for Disney world and 10 minutes to Universal Studios! Shopping outlets and restaurants are minutes away! Our unit has over 1,400 square feet with beds for 8 people and ceiling fans in all the bedrooms and the great room! Our luxury 3 bedroom, 2 bath condo is a FIRST floor unit, located near the pool. Our condo has over 1,400 square feet with beds for 8 people and ceiling fans in all the bedrooms and the great room! We have a pack-and-play playpen, highchair and umbrella stroller for our younger guests also! The master suite, with a lovely en suite full bathroom has a king size bed, (pillow-top mattress), cable TV, large closet, and clock radio. Our second bedroom has a queen size bed, (pillow-top mattress), large closet, clock radio, DVD player and cable TV. The third bedroom has two twin beds and a set of bunk beds with a twin and full size bed. It also has a walk-in closet, DVD player and cable TV. All bedrooms have NEW mattresses and we provide you with all bed linens, pillows and towels. The second bathroom is accessible from the kid's bedroom or the hallway. Both bathrooms have roll-under counters for our handicapped guests, and the master bathroom has a roll-in shower. Our living room has two relaxing sofas, and a dining table with seating for six. There is also air conditioning, cable TV and a DVD player. Our unit has a fully equipped kitchen, with everything you could possible need: dishwasher, microwave, coffee maker, electric can opener, blender, and 4 slice toaster. We provide all crockery, cutlery, glasses, pots, pans and cooking utensils. There is also a full size washing machine, separate tumble dryer, iron and ironing board. Our condo has free, secure high speed wireless internet and is fully handicapped accessible and equipped! We fell in love with Florida and Windsor Palms in 2007, so much so that we purchased a condo at the resort. We love vacationing here and we try to add all the 'extras' to our condo to make it special for our guests! Bathrooms are both handicap accessible, with roll under counters. The master bathroom is also equipped with a roll-in shower and adjustable height shower head. Fully stocked game room and arcade at the main clubhouse! NO PETS! NO SMOKING INDOORS! The condo has a high chair, pack-n-play and umbrella stroller for our guest's use during their stay! Once again we had a wonderful time. This was our 4th year renting the condo from Debbie and it is always perfect. Family and friends visited and everyone enjoyed themselves. Needless to say we are already looking forward to our next visit. I would highly recommend anyone to stay here it is perfect. Debbie you have a wonderful place and again thank you for sharing it with us. Sincerely, Pam and Wayne. Overall comfortable place, would return. Thanks for staying with us, we're glad you enjoyed your vacation! Have a great 2019!!! The property was neatly maintained. Our condo fit our needs perfectly. It made us feel right at home. Thanks Faye! I'm so glad you enjoyed your stay and we look forward to hosting you again in the future! We enjoyed our stay! We go to Florida often and this was one of the most comfortable, quiet and safe condos we have ever stayed in. The location is perfect for everything you need, including close proximity to the parks! There were plenty of towels and washcloths, which meant we didn't have to use the washer and dryer as often, an important aspect of enjoying more vacation time! Loved that the condo is on the main floor and no stairs to climb! We are so happy you enjoyed your stay at our condo! Thanks for the great review and we look forward to hosting you again! Pam, It's always so great to host you and your wonderful family! We are thrilled you enjoyed your vacation! 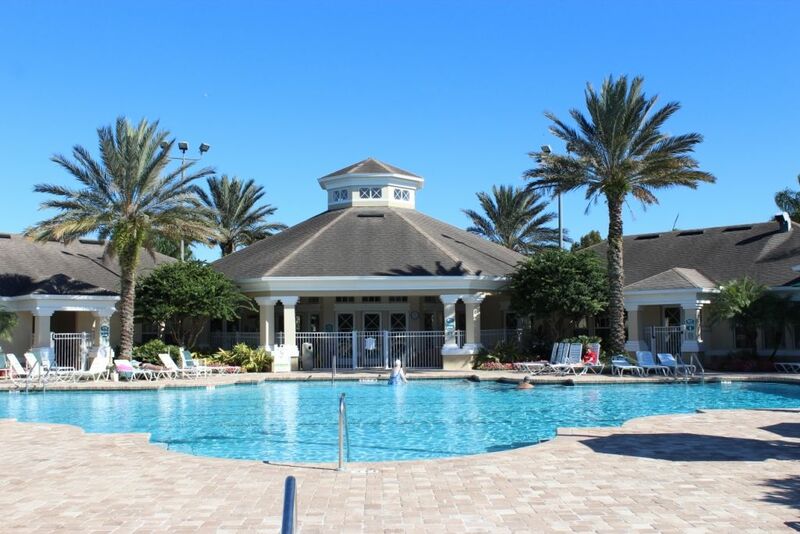 Windsor Palms Resort is a quiet gated community just off the 192 and within 3 miles of the main Disneyworld entrance. Access to Interstate 4, 192 and International Drive means all of the other attractions like Sea World and Universal Studios are only 15 minutes away. The main shopping outlets, supermarkets and a wide variety of restaurants are all available within a few minutes drive. The golfing facilities are superb with 5 championship courses within 5 miles and over 25 courses within a 10 mile radius. It's approximately an hour drive to Clearwater & St Petersburg in the West and a visit to Cape Canaveral is 45 minutes to the East. Here you can also hire a boat out to have some great offshore fishing! This part of Florida feeds the southern everglades, so there are some wonderful lakes full of incredible wildlife and some of the best lakes for fishing can be reached easily. All sports and leisure facilities at Windsor Palms Resort are inclusive in the price. No Pets Cleaning Fee of $75.00 for stays less than 7 nights.